Attending and presenting at International Symposium for Pediatric Pain 2015 in Seattle. 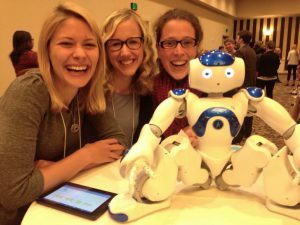 Photo: Lauren Heathcote, Katelynn Boerner & Line Caes posting with MEDI, a robot to distract children during painful medical procedures. Line joined the University of Stirling as a Lecturer in Psychology in July 2016 and we were impressed by how quickly she settled in – getting her RMS page up and running on Day 2! – and wanted to know more about her research and what brought her to Stirling. Lauren and Fiona met with Line to discuss her research journey, interests and how she is finding it here at Stirling. Line’s main research interest is that of paediatric pain, exploring the effect of children in pain on both the child and the parents with the hope of identifying methods that can both improve the quality of life of the child in pain and the support provided to parents of children in pain. Line’s research career began with a distinct motivation to focus on children in her research and following her psychology degree, Line found a supervisor and a PhD thesis at Ghent University and her motivation to continue her research was encouraged by the supportive environment that paediatric pain research sits in. Following her PhD, Line recognised that in order to continue her independent research career she had to make a move from Belgium – a move which involved a new country and leaving her husband back in Belgium. Canada is recognised as the hub for paediatric pain research and after speaking to her network about opportunities, Line undertook a post-doctoral fellowship at the Centre for Pediatric Pain Research (IWK Health Centre, Halifax, Canada). Recognising early on, that connections and a strong network were imperative to her research career, Line reflected that if she was to start her career again, she would have undertaken her lab visits earlier in her PhD career and encourages other PhD students who have the opportunity to visit other labs and build networks to do so as early on as possible. One way that Line did expand her networks was through a training programme that is offered in her field of pain in child health, which provided financial support to allow Line to make international visits and establish collaborations across the globe – a feature of her career that she is very grateful for. Line recounted her networks and connections as one of her notable achievements within her career, recognising that through her connections she was able to establish her independent research career and will continue to nurture her connections as she continues her career. Line noted two publications as paramount to her career. Both published in PAIN, the first is an experimental study, which received the Dr John T Goodman Award for Student Research in Pediatric Pain and for second she reviewed, along with colleagues, the evolution of publications in paediatric pain since 1975. 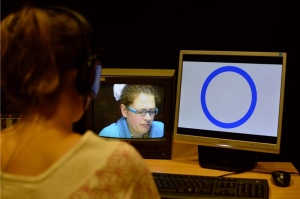 Set-up of the experimental study exploring parental stress reactions to their child’s pain experiences. Line is also part of the Society of Paediatric psychology, a division of the American Psychological Association, in which Line’s membership enables access to a network of peers, funding for international travel and visits and supports her ability to enact change in her field. From Canada, Line moved to Ireland in 2014, taking up a lectureship at NUI Galway before joining Stirling in 2016. Line reflection on her move to Stirling noted that Stirling had no pain research but strong established health psychology and developmental psychology research. Therefore, Line saw the opportunity to combine both these established units and develop her independent career by establishing her own paediatric pain lab rather than continuing to be a part of pre-established research teams. 1. the supportive and caring environment that she works in with consideration of the support from the university to develop her career and also in her well-being, recognising a recent course run by the Training and Development team on personal effectiveness as demonstrating that the university really does care about more than just outputs; As a true dog lover, it is amazing to be part of a division that allows and strongly supports bringing your pets to the office! Cuddling a puppy is the best break ever! 2. the beautiful campus in which the university sits, which encourages Line to get out and enjoy the fresh air, take time away from her desk and get inspired from the scenery. Line’s second most notable achievement during her career is the applied element of her research and the importance that she puts on her research to be applicable to clinicians, parents and children. Line recounted that it was important to her to listen to what clinical staff are saying and try to ensure her research is tangible to their needs. 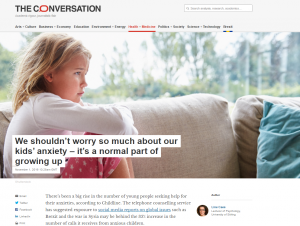 It was this feature of her research that led to her recent article for the Conversation on childhood anxiety. Leading on from a workshop held on campus with the Conversation, Line pitched her article idea on the Thursday thinking she had plenty time to craft it, but following a related article in the Guardian, Line had to move fast and her article was published on the Tuesday. Using Children of the 90’s research Line analysed at the University of Bath, it was found that worries peak in children of the age of 10 and that by 13 years old, children worry less but they have more control of their worries. Line’s motivation for the article came out of her desire “to get her work out beyond academia” and despite being very busy when her pitch was accepted, she recalled it was “too good an opportunity to miss”. Complementary of the process, Line recounted that the process of writing for The Conversation and the workshop have been hugely supportive of her writing style and goes beyond the writing of an article to also grant writing. Since the article was published, Line has enjoyed engaging with the comments left on the article and the engagement the article has generated on Twitter, noting that she has broadened her academic network as a result and looks forward to the opportunities that will result from the article. We really enjoyed speaking to Line and it sounds like she has some fantastic collaborative opportunities which will enable her to continue making her mark in paediatric pain research at Stirling. If you are interested in knowing more about Line’s research please do not hesitate to contact her.